Two key things happened here in the Sequoia National Forest to birth this very important post: (1) I cleaned a rack in my kitchen and found a s’mores kit the boys had been given some months back and (2) I saw a viral picture on Pinterest or Facebook of using a rake in a fire pit to make s’mores. What do you do with a bag of marshmallows after all? I mean, they aren’t really edible. If the bag got opened, they would get eaten and I would consider that a fail in itself. So what do you do with a bag of marshmallows? These boys really are too smart for that, mainly because they don’t eat many marshmallows…. Really, this cannot work, I tell myself. 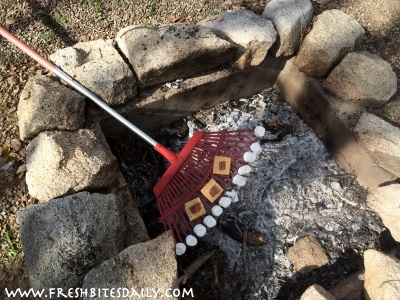 These marshmallows will be completely inedible coming off that rake. What a way to waste a dozen marshmallows. Right: What a way to waste a dozen marshmallows!!!! I will say that this project was almost a complete success. The one little hiccup was finding my 5-year-old with a marshmallow he snagged from the rake. Ewwww. I traded it for one out of the bag. Just as a “pro tip,” if you plan to embark on this fascinating project and plan to eat the actual s’mores from the rake, you may want to buy a rake without paint to dedicate to this project. That way, at least you’ll be eating marshmallows off of regular aluminum not intended for food rather than off painted aluminum. We “sanitized” the rake by burning it in the fire, though that really didn’t make a difference in the case of our red-painted-rake.